Herbal fire starters are the perfect way to start the fireplace or wood stove roaring on those cold winter nights. I think they’re a splendid way to incorporate the summer garden into a winter holiday tradition! Use them to light those bonfires and campfires too, as the burning herbs help repel pesky mosquitoes and other insects. Personally, I like to tie one on a bottle of wine, as they make a great addition to any hostess gift! 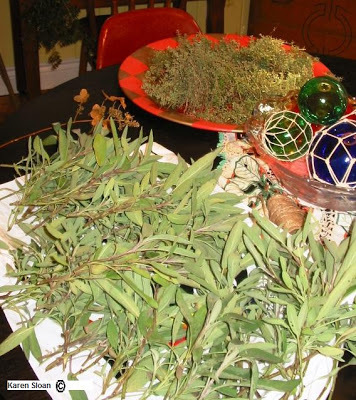 All kinds of herbs and dried plant material can be incorporated into these bundles. I add many herbs including Sage, Oregano, Thyme, Lavender, Marjoram, Oregano, Mint, Lemon balm Tansy, Savory, Artemisia, boxwood, Statice flowers, Echinacea, Yarrow, black-eyed Susan seed heads, and even dried licorice plant stems from my hanging baskets. Simply layer different dried herbs together and tie them with raffia. They can also be braided and hung on the wall, waiting to be used. I especially like using Lemon Thyme in my bundles. It smells so nice! Again, simply dry it flat on an old tray. Same thing goes for Sage, but hanging it up to air dry works well, too. When it’s time to clean up the garden, take a good look at what can be used from your own garden to create these easy DIY bundles, and save yourself taking it to the landfill!